This Portable Wood Kitchen Trolley Cart Is Ideal For Adding Extra Counter Space To Your Kitchen. Featuring Double Drawers, Two Chrome Plated Pull Out Baskets And Two Other Pull Out Shelves, It Offers Plenty Of Storage Space. Made Of Ceramic Tiles, The Top Is Very Sturdy And Durable.Don't Hesitate To Add It To Your Cart! 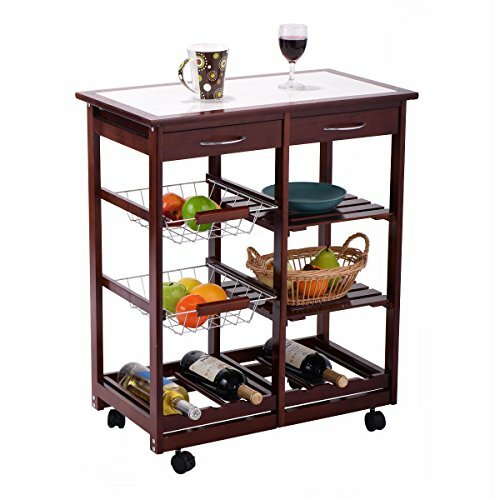 【Ample Space for Storage and Display】- Our kitchen trolley cart is made of two drawers, two metal baskets, two shelves and one bottom wine rack. All of them offers sufficient room to store and classify your various stuff such kitchenware, wine or fruit etc. 【Easy to Move with 4 Casters】- Four multi-directional and flexible casters are assembled well at bottom of the kitchen trolley cart. They enable the cart to be moved freely and rotate 360 degree. But if you want it stop, it can also maintain stable and sturdy. 【Easy to Assemble】- Specific manual and complete accessories help you save much effort and time to assemble the cart well. Detailed assembly steps are listed in the instruction for your reference. 【Sturdy and Durable Trolley Construction】- The trolley frame is mainly constructed of high-quality and strong pine wood and processed with exquisite finish. The table is inlaid with ceramic tiles which makes it look more elegant and stylish. Although it is lightweight, it has powerful capacity. 【Multifunctional Trolley Cart】- Not only is this trolley island cart suitable for home use but also commercial use. It will bring you much convenience to organize your kitchen and restaurant. It can be used for storing and organizing your glasses, wine, fruit, dishes and cups etc.